I've been lurking for awhile and, through the help of some good folks on this board, gathering hard to find parts. 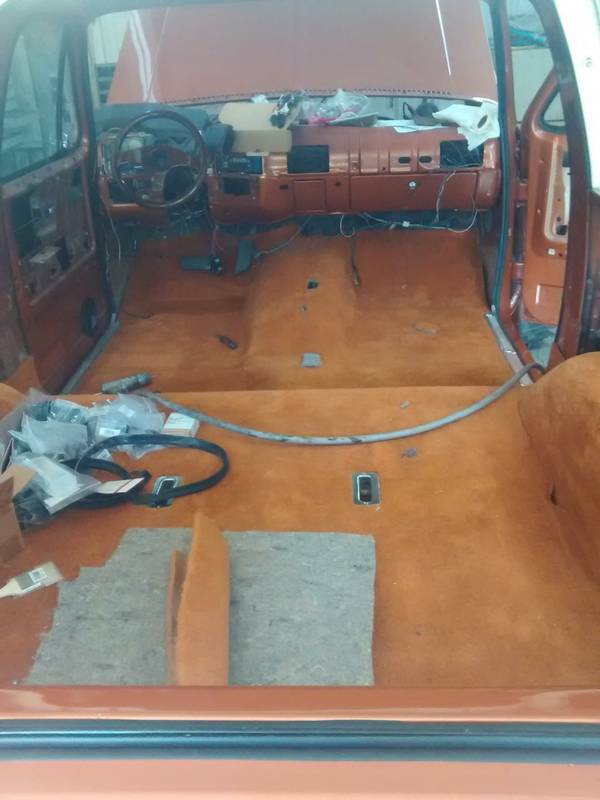 I wanted to share a few interior photos of the project with some explanation. 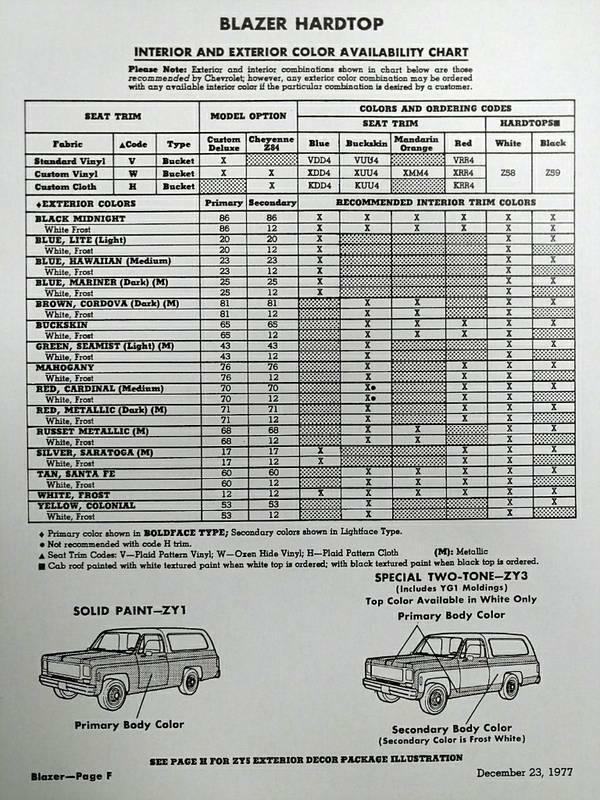 This is my Dad's 1978 K5 Blazer he bought brand new from Nehls Chevrolet in Marshall, TX. He needed a good truck to run around oilfield roads to check on the family's gas and oil wells. It's also the vehicle my brother and I learned to drive in. Dad hasn't driven it much over the past 20 years because it wasn't dependable anymore and it rode like poopoo. That's where I come in. We installed a Ramjet 350 in it about 10 years back. Now we're really gonna line it out. 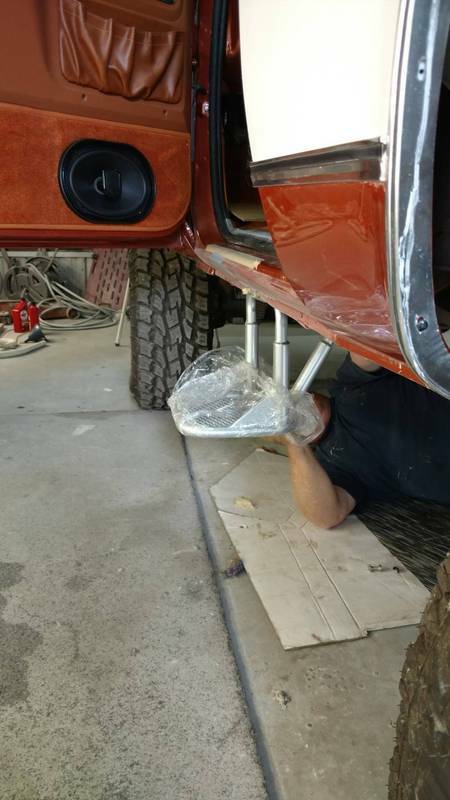 We're adding Offroad Design suspension components, restoring the interior to awesome and adding new paint. 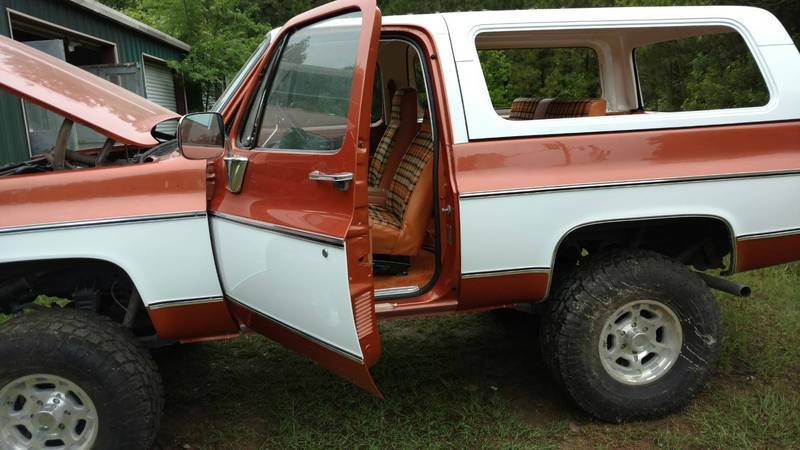 In the mid 90's he sent it over to a conversion van outfit over in Shreveport where they unsurprisingly made it look like a conversion van: super plush velour, high gloss woodtrim accents and shag looking carpet. 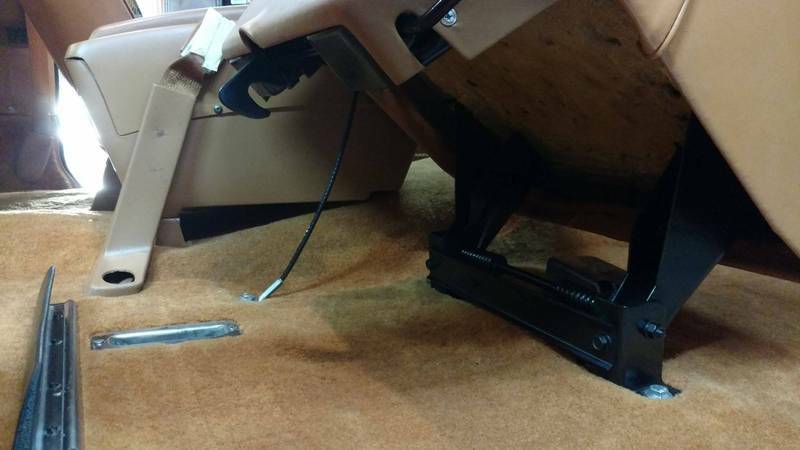 It was new feeling, but they removed the center console in favor of a combo bench. They eliminated the flip-up passenger bucket and the ability to access the rear bench easily. It just was wrong ultimately. 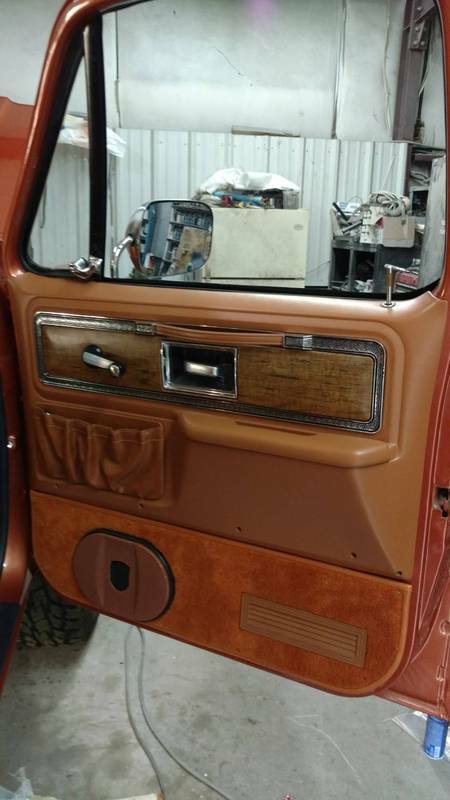 I wanted to restore the vehicle to 1978 like condition. 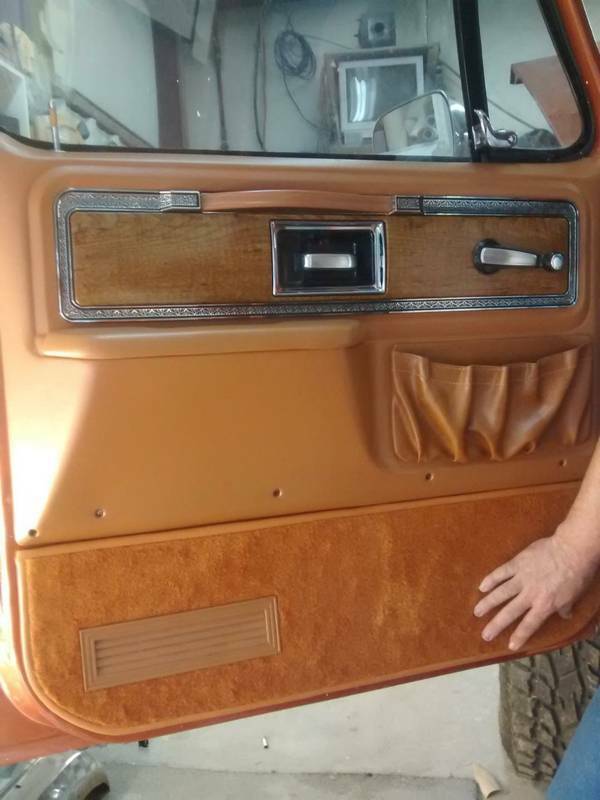 But I also wanted to pick and choose pieces from adjacent years that spruced up the vehicle (like the mid-70s woodgrain stuff). Let's get started. 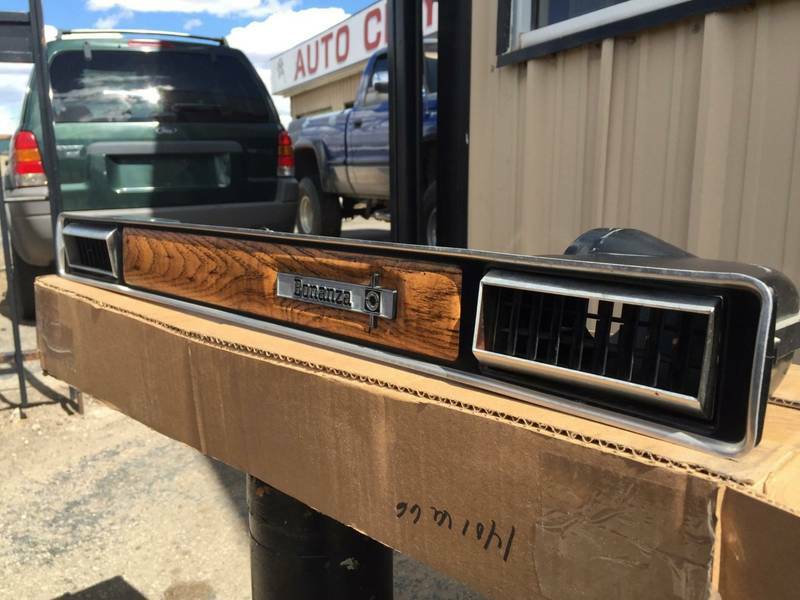 Here's some woodgrain stuff. The truck originally came with the mandarin orange vinyl. 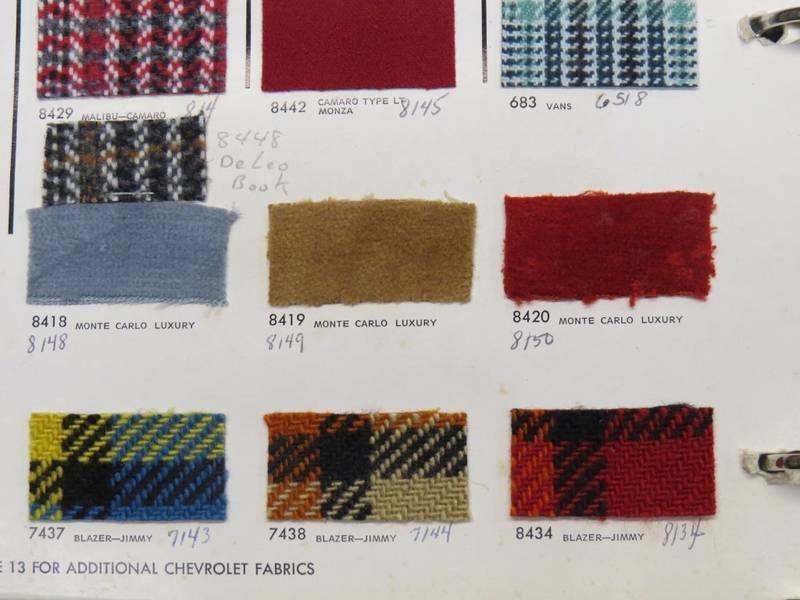 The '77/'78 interiors came in blue, red, buckskin and mandarin. The first three had a custom cloth option, the mandarin did not. 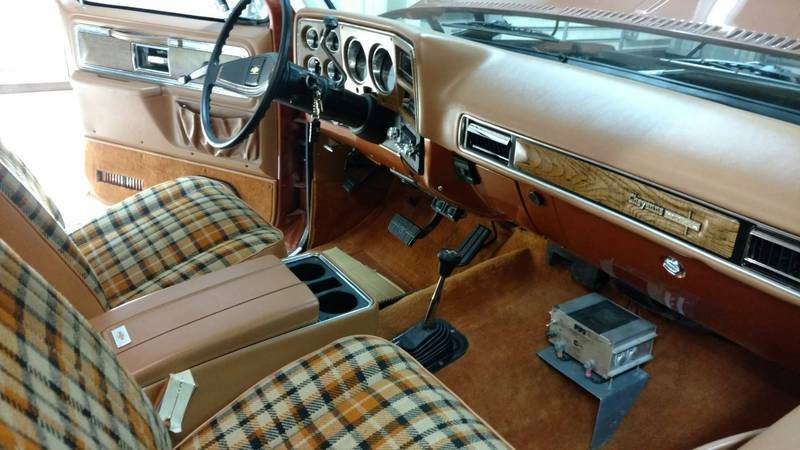 All you could get was the custom vinyl, I suspect, due to the low take rate of the mandarin interior. In fact, mandarin was only available for two years. 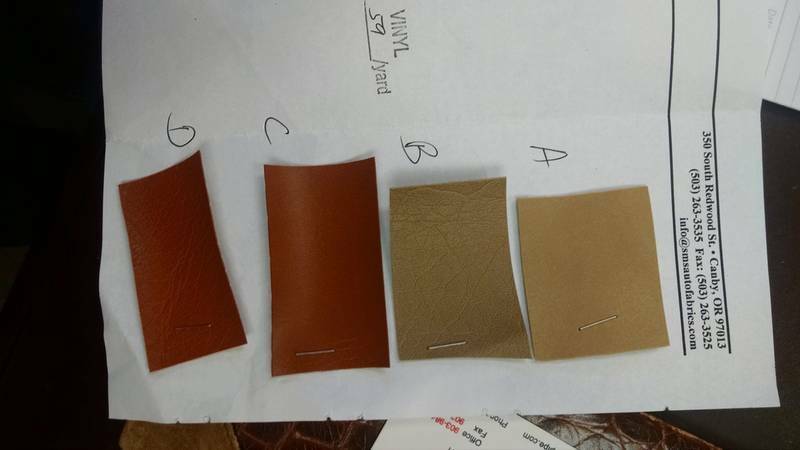 I had one of the storehouses send me some pictures and samples. What I suspect is that the 7438 was designed to work for both the buckskin and the mandarin interiors. It just never was delivered in that combination. Well.......I fixed that. I'll provide updates as they come. Last edited by buffydores; 10-27-2017 at 11:38 AM. Here's something cool. 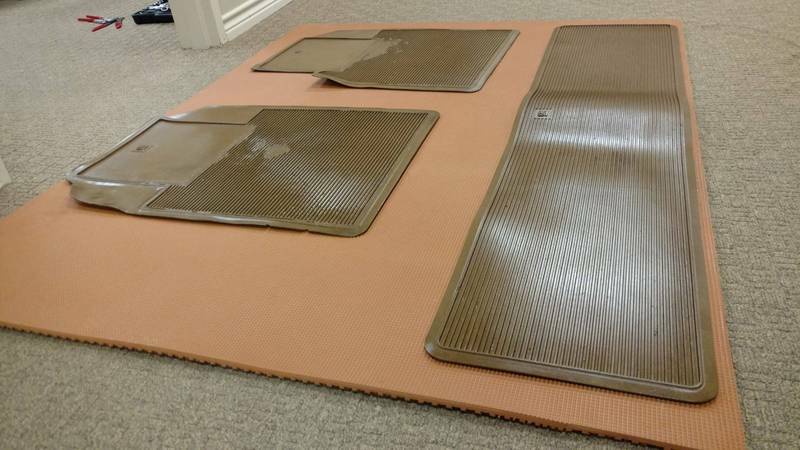 I tried to restore the original mud mats, but they're just too oxidized. After some interwebbing, I found some super thick rubber that matches my interior color very well. I'm gonna cut to fit. Last edited by buffydores; 07-19-2017 at 04:28 PM. Here's a factory accessory step I found on eBay (used would have been much better). Out of the box, they're kinda silly for a lifted truck (did I mention the 4" lift?). We modified the steps to be 5" lower and stick 3" out further. Then we powdercoated them silver. I forgot to photograph that, but I'll show the finished ones attached. Some won't like the look, but they're incredibly functional. Last edited by buffydores; 07-19-2017 at 04:57 PM. Sweet truck and congrats on getting rid of the conversion van interior. Those are my favorite seats. I have two low back tan vinyl with orange plaid and two high back red/ red plaid. Yours look great. Thanks. Brand new 40 year old seats. Paint is shaping up, and the new black stripes in the trim. The rear glass went in a few hours later. Needed to add some steering fluid and bleed it out. Last edited by buffydores; 07-19-2017 at 04:33 PM. Test fitting the reworked GM accessory steps. The step now hangs halfway between the ground and the floor. There's the concern about being hit by debris, but Dad is 70. I'll pay for the repair. I'd much rather Dad be able to get in his Blazer safely. Last edited by buffydores; 07-19-2017 at 04:35 PM. Here's a nice touch Dad doesn't know about. He'll really like this. I had the glass etched with the old company logo. Last edited by buffydores; 07-19-2017 at 04:36 PM. Interesting tidbit. 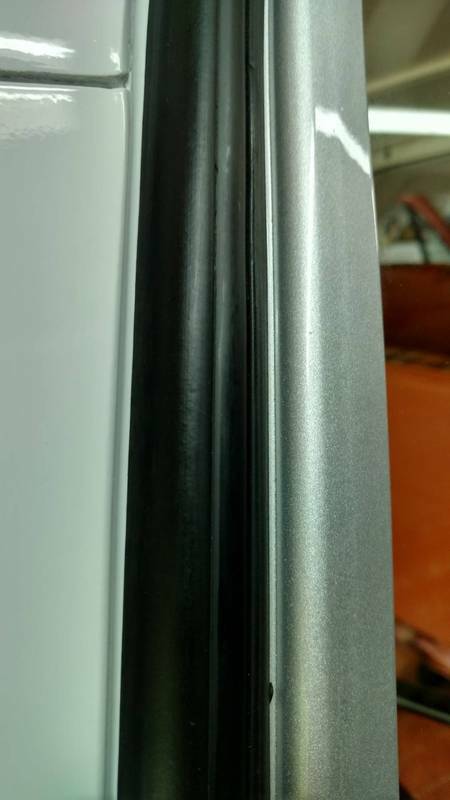 I purchased a replacement seal for the side glass, but after looking at the original for a bit, we realized it was in phenomenal condition. Not a single crack in a 40 year old seal. 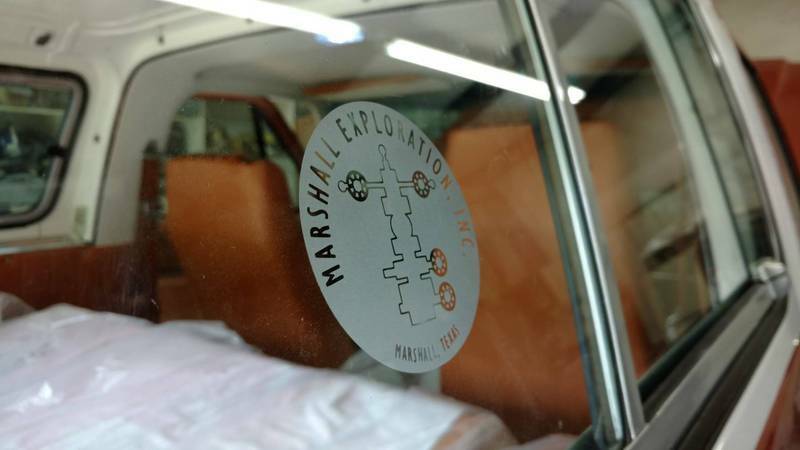 You can actually get vinyl cut and it looks just like etched glass. Just for future reference. Killer looking truck! Thanks for the tip. Cool to know. But in this case, the whole point is to make it permanent. There was a sticker there for 30 years, but it had faded bad. 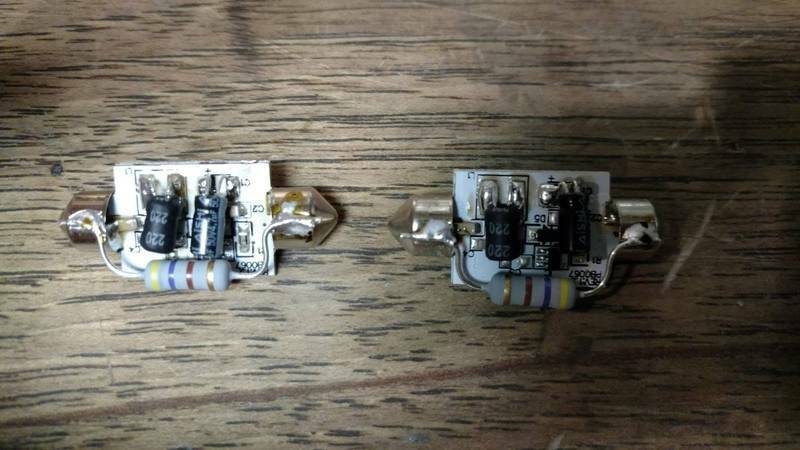 I soldered some resistors (460 ohms) on these LED dome lights I purchased to address the ambient voltage. I'll see if they work tomorrow. The LMC kit had some silly blueish LEDs. These are much warmer and brighter with some yellow light. To get a 34" spare to fit, we moved the whole bracket up an inch; however, we still need to move the hole for the carriage bolt over around 2". I'm gonna lift it another inch while we're at it. We're gonna use a triangulated plate of 5/16" to make it. Then paint it with the same black Imron. I wonder if any other clearance issues will develop on the bracket. Last edited by buffydores; 08-07-2017 at 08:03 AM. The LED lights work great now. Updated picture of the door. The speaker screen is not an exact match, but good enough for now. Here's what 40 year rubber looks like. Wow! 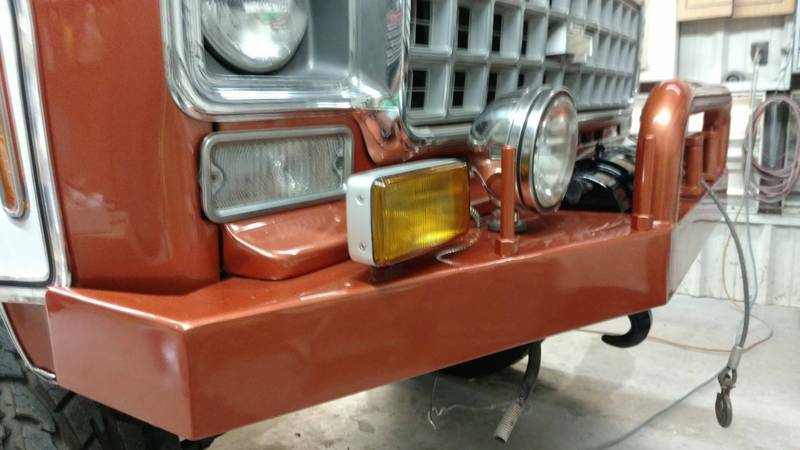 Dad's custom bumper from the 70s. 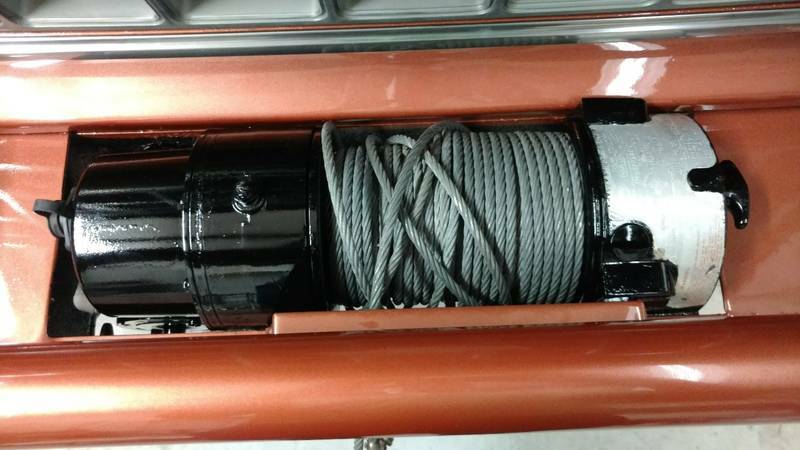 Winch has been sprayed with Imron Black. Waiting on an old school Ramsey logo decal. 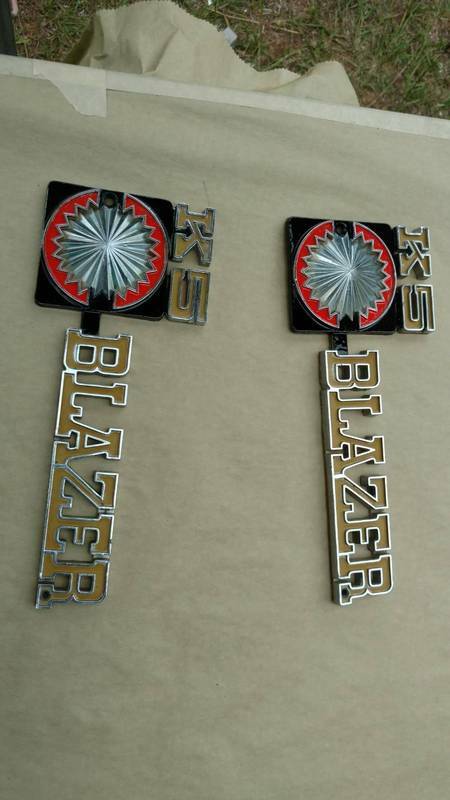 Touch up paint on the emblems. Anybody know where to get that mustard yellow paint? Last edited by buffydores; 07-19-2017 at 04:51 PM. I like these next couple of shots of the interior. 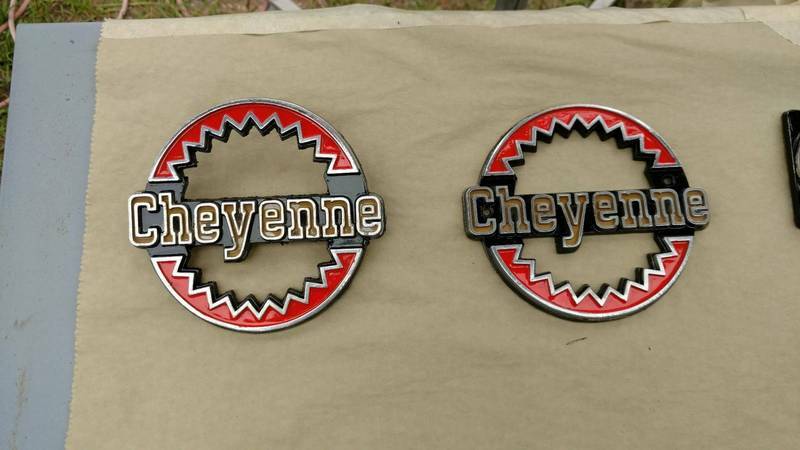 You can see the better Cheyenne badge on the dash. If you look close, you can see the new pedals. Last edited by buffydores; 07-19-2017 at 04:45 PM. 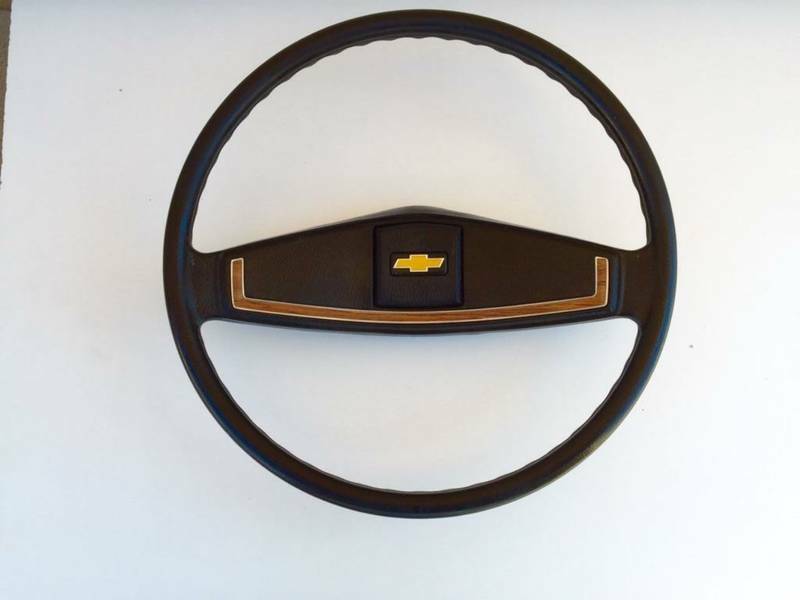 Where did you get the dash pad? It looks too nice to be original. A company called Just Dashes in California will take the original and rewrap in new vinyl. 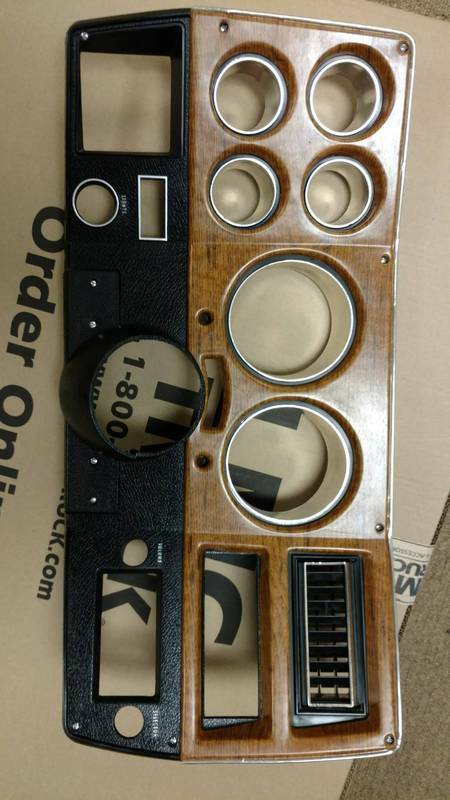 Expensive, but it's an original dash. Wanted to show how wonderful the passenger side seat turned out. 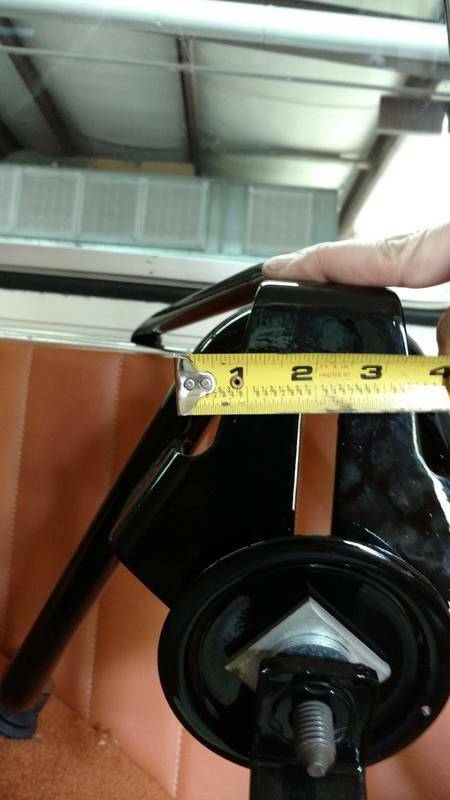 Found a great seat bracket on eBay that we retouched with satin black. Last edited by buffydores; 07-19-2017 at 04:46 PM. Anybody figure a good way to keep the seat belt up so it doesn't drag on the seat when lifted? I have a military Blazer, and somehow those are in great shape in my truck. They are not exactly like the civilian ones but they'll work. You might use a set of those if you can find some. There's several guys online that part out CUCV's. I bought HDPE plastic binder at Office Depot. I'm gonna cut a slither of that and use it to prop the seat belt up with a zip tie. Semi-ghetto, but I'll do that until I think of something better. Last edited by buffydores; 07-19-2017 at 04:47 PM. John, kind of funny you mentioned that! It was actually me that hooked Joe(Squarebody Syndicate) up on the yellow spray paint. I had been using it forever when he was still using model brush paint. I will also add that the spray will last a LOT longer than any model paint! 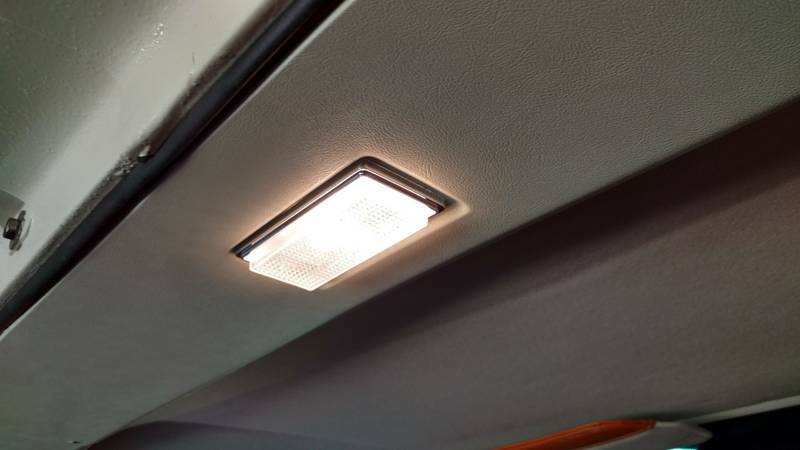 It is designed for industrial outdoor use. Thank being said, that Blazer is beautiful! Thank being said, that Blazer is beautiful! Thanks Jeff. 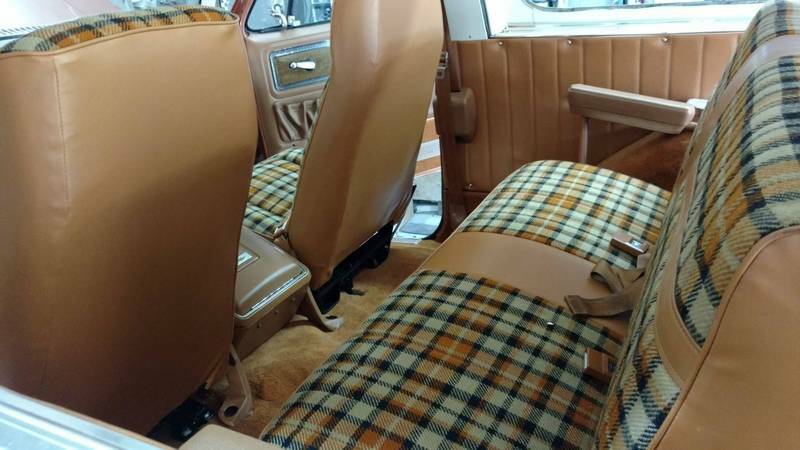 The more I'm around the mandarin orange with orange plaid interior the more I question why GM never pulled the trigger on the combo. It feels so honest to the 70s vibe.